Equine-Facilitated Learning sessions with Leigh Shambo in Bishop CA are possible on an individually tailored basis. Formats include ongoing sessions of 1-2 hour duration; intensives of 3 hours or longer for one to three days; small group workshop lasting two days. Sessions are appropriate for individual or small group of 2-4 people. Leigh offers free consultation by phone to answer questions, discuss goals, formats or dates. Consultation and personalized mentoring is available with HEAL Founder Leigh Shambo, MSW, LPCC, CBEIP-MH, author of The Listening Heart. Common topics for professional consultation include: EFPL client treatment planning and progress, EFPL certification and training, equine therapy site development, equine training and handling for EFPL. There is no charge for an initial call to find out if this modality will be useful for you. Leigh has helped many EFPL practitioners find their path, start or grow their business, or gain insight into challenging clinical situations, or understand what a horse in your herd is trying to say through its behavior. 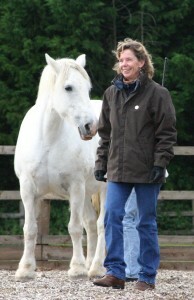 Leigh is a lifelong teacher and leader in the field of equine-facilitated psychotherapy and learning, who founded Human-Equine Alliances for Learning- HEAL in 2000. A professional riding instructor and horse trainer since 1979, Leigh has long incorporated mindfulness, and relational wisdom to enhance the human-horse bond. “When you put relationship first, performance follows.” Leigh is a longstanding member of PATH International (formerly NARHA) who has worked with diverse riders of all ages and abilities. Leigh’s professional experience in the mental health field began in 1996, with a specialization in psychiatric vocational rehabilitation. Leigh earned her MSW in 2000 and holds license as a clinical counselor/psychotherapist in California and Washington. An award-winning presenter and teacher, Leigh is also the lead researcher for studies sponsored by HEAL on the efficacy of EFPL for treating complex PTSD. Her articles have been published in HETI’s Scientific and Educational Journal for Therapeutic Riding (2010 & 2011). Leigh’s qualifications in EFPL include Advanced Instructor status at the Epona Center, where she studied in 2003-2006 under Linda Kohanov and Kathleen Barry Ingram. 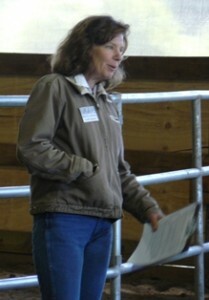 Leigh also has training in EAP from EAGALA and from Three Eagles Ranch with Adele and Deborah McCormick. Since the inception of HEAL in 2000, Leigh has been invited to present and teach across the US and other countries including Canada, the UK and Norway. She consults with EFPL practitioners and trainees worldwide. Leigh began the HEAL Facilitator Training Program in 2008. This in-depth, select certification training attracts seasoned therapists from many countries to study at HEAL. Payment is due 10 days after your scheduled consultation. If a schedule change is requested more than 24 hrs in advance of a session there will be no cancellation fee. If a schedule change is requested with less than 24 hrs notice there will be a 50% cancellation fee charged. Call the HEAL office at 760-873-8980 to schedule a consultation or email leigh@humanequinealliance.com.